Home / How to set up WooCommerce Wholesale Pricing using ELEX WooCommerce Catalog Mode, Wholesale and Role-Based Pricing plugin? 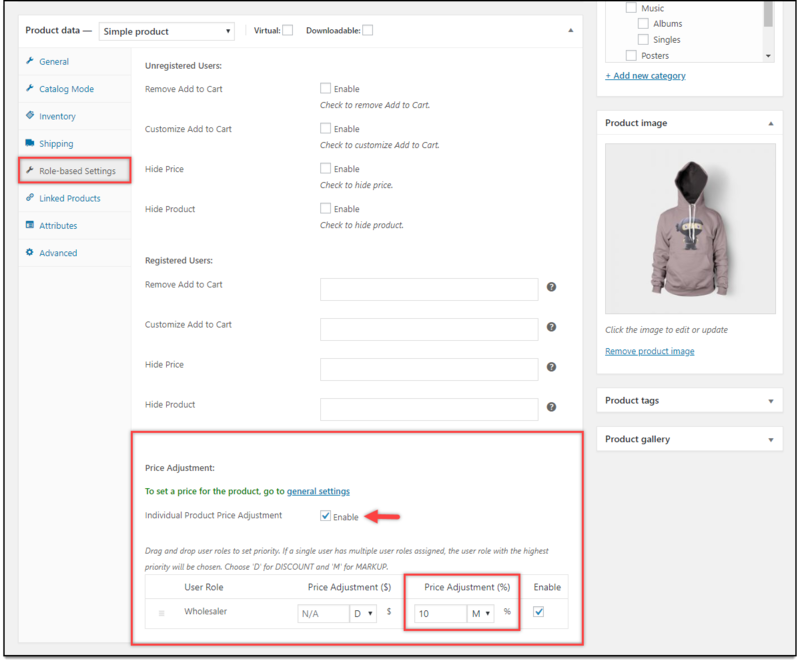 This article intends to explain how to set up WooCommerce Wholesale Pricing using ELEX WooCommerce Catalog Mode, Wholesale and Role-Based Pricing plugin. Refer the Product Page to know more about other various features of the plugin. 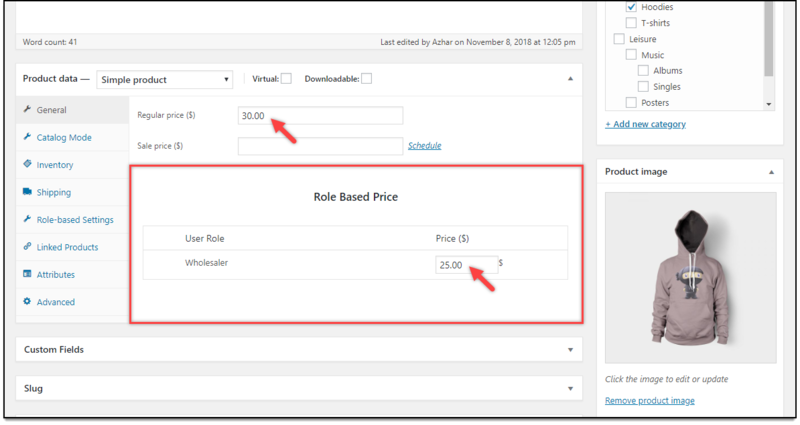 The ELEX WooCommerce Catalog Mode, Wholesale and Role-Based Pricing plugin facilitates you to set up role-based price adjustments, catalog mode, and tax display options. You can configure custom product prices based on user roles as well. In addition to this, you can set a price adjustment and catalog mode at the product level. One of the most often requirement we come across in role-based pricing is to set up a custom interface for Wholesalers. Our plugin offers some handy options to set this up. Let’s look into these features in detail. If you do not have a wholesale user role for your WooCommerce store, you can create one in the plugin. To do this, go to WooCommerce > Role-based Pricing > Manage User Role. 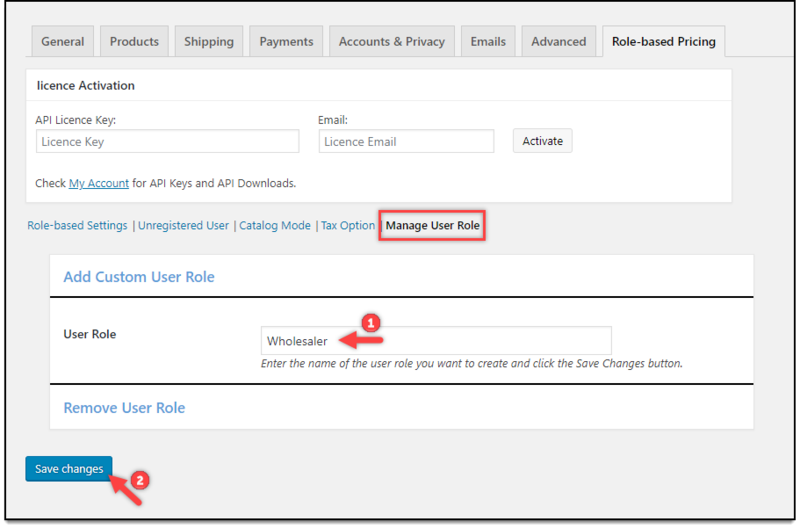 In the Add Custom User Role setting, enter the name Wholesaler, and click Add User Role button. A screenshot of the setting is as shown below. How to set up WooCommerce Wholesale Pricing? Price adjustments applied to all products, for wholesaler user role. Price adjustments at product level for wholesaler user role. Setting custom product price for wholesalers. Setting price adjustment for wholesalers. Consider we have a WooCommerce store with products as shown in the screenshot below (notice the product price). Go to WooCommerce > Role-based Pricing> Role-based Settings > Price Adjustment: (Discount/Markup) section. The Wholesaler user role can be seen as shown in the below screenshot. Enter a value of 5 in the amount adjustment column and select option “M” (for markup) and tick the enable setting to enable the respective price adjustment option, as shown in the above screenshot. When a wholesaler logs in to the store, the updated price can be seen as shown in the screenshot below. Not only can you apply price adjustments for all products based on user roles, but at the product level as well. Which means, you can configure custom product price based on user role, and adjust price adjustment for a specific product based on user roles. These settings are available on every product edit pages. 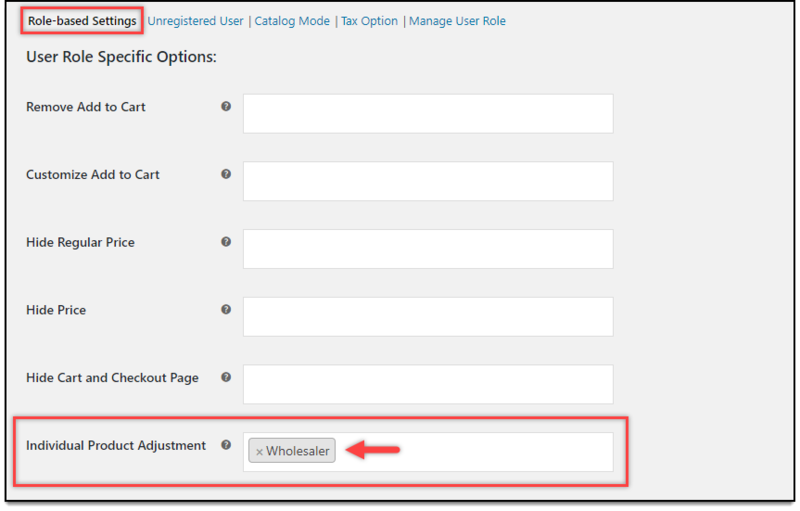 To set up individual product adjustment, you need to select Wholesaler user role in the Individual Product Adjustment setting in the Role-based Setting section of the plugin. A screenshot of the settings is shown below. Open a product to edit. In the General tab of product data meta-box, a new section to enter custom product price can be seen, as shown in the screenshot below. Enter a custom product price for wholesaler user role, and save the settings. The new product price for wholesale will be displayed as shown in below screenshot. For product-level price adjustment settings, a new section is available in the product data meta-box, as shown in the screenshot below. 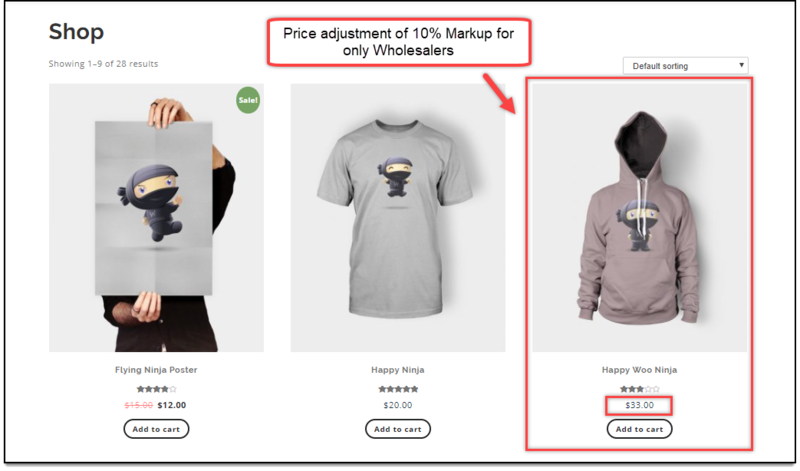 Enter a price adjustment amount, say a markup of 10%, select option “M” (for Markup) from the dropdown and enable the price adjustment for the wholesaler user role. When a wholesaler logs in to the store, the updated price adjustment can be seen as shown in the below screenshot. Therefore, in this way, you can achieve WooCommerce Wholesale Pricing on your WooCommerce store, with our WooCommerce Catalog Mode, Wholesale and Role Based Pricing plugin. How to configure Tax options based on User Roles?